Jackfruit | Infonet Biovision Home. Originating from India, it is now widespread in other parts of the tropics and most popular in Sri-Lanka. 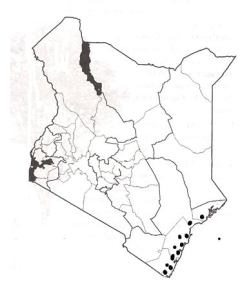 Introduced to East Africa and now widely planted in the coastal areas of Kenya and Tanzania. The jackfruit tree is believed to originate from the rain forests of the Western Ghats of India. It spread early on to other parts of India, southeast Asia, the East Indies and ultimately to the Philippines. It is planted in central and eastern Africa and is fairly popular in Brazil and Surinam. It is suitable around homesteads as a shade tree or support for climbing crops like yams and passion fruit. It flowers during the rainy seasons, April - May and October- November at the coast. Grows in sandy soil but prefers well-drained and fertile soils and will not tolerate coral rag, shallow soil, drought or waterlogging. Found in agro-ecological zones I - II. Propagation is usually by seeds; seeds need not be kept longer than a month before planting and germination takes 3 to 8 weeks. The seedlings should be moved when no more than 4 leaves have appeared as more advanced seedling, with its long and delicate tap root is very difficult to transplant successfully. (This therefore calls for direct sowing at site). Vegetative propagation (Cuttings, bud grafting, air layering and root cuttings) is also possible. Seedlings do not tolerate root pruning well. Add ash around young seedlings and newly sown seeds to keep insects away. Food: Pulp of ripe fruit is edible. It can be eaten fresh or made into various local delicacies like jam, jelly and paste, chutney or preserved as candy by drying or mixing with sugar, honey or syrup. It can also be cooked as vegetables, pickled or canned in brine or curry. The seeds are eaten after boiling or roasting, dried and salted as table nuts, or can be ground to make flour that is blended with wheat flour for baking. Male spikes left to rot on trees are used as a salad or pickle. Fibre: The inner part of the bark or bast is can be made into cordage or cloth. Timber: It produces a medium hardwood; resistant to termite attack; fungal and bacterial decay and is easy to season. It takes polish beautifully. Though not as strong as teak, this wood is considered superior to teak for furniture, construction, turnery and inlay work, masts, oars, implements and musical instruments. Its roots produces high quality carvings and picture frames. Gum or resin: It yields resin; latex yields 71.8% resin, consisting of 63.3% fluavilles (yellow) and 8.5% albanes (white). These resins may be valuable in varnishes. Latex or rubber: This latex is commonly used as adhesive for mending broken chinaware or earthenware, caulking boats, mending holes of buckets and trapping birds and in some countries it serves as a substitute for rubber. Tannin or dyestuff: The bark gives a dark, water-soluble resinous gum that contains 3.3% tannin. When boiled with alum, the sawdust or chips of the heartwood produce a rich yellow dye used for silk and the cotton robes of Buddhist priests. Alcohol: Arils are fermented and distilled to produce an alcoholic beverage. Medicine: Ashes of leaves, with or without oil, can be used to treat ulcers, diarrhoea, boils, stomach-ache and wounds. Pulp and seeds of the fruit are regarded in some countries as a cooling tonic. Seeds are considered an aphrodisiac. The sap is said to be an anti-syphilitic and a vermifuge. Wood is believed to have sedative properties, and its pith is said to be able to induce abortion. A root decoction can be used to alleviate fever, treat diarrhea, skin diseases and asthma. The bacteriolytic activity of this tree?s latex is equal to that of papaya latex. Erosion control: This tree can be planted to control floods and soil erosion in farms. Shade or shelter: Planted at a close spacing, this tree act as a windbreak and is sometimes used as shade for coffee. Boundary or barrier or support: It can be used to mark boundaries and the trunk is occasionally used as living support for pepper. Intercropping: In some countries, it is planted with coconut groves; In Malaysia, trees have been used as an intercrop in durian orchards, and in India the trees are intercropped with mango and citrus. Young jackfruit orchards may be intercropped with annual cash crops such as banana, sweet corn and groundnut. 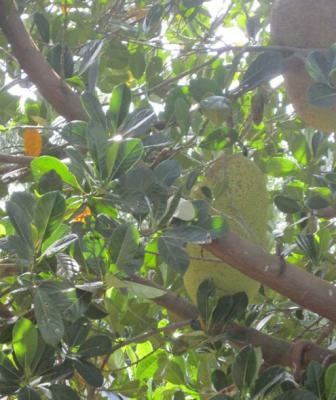 The jackfruit tree and fruit are afflicted by a variety of pests and diseases where it is commonly grown. Majority of insects belonging to the Aphididae, Ateyrodidae, Cercophidae, Coccidae and Fulgoridae families feed on its sap. The include; Anomala spp., Batocera rubus, Dacus umbrosus, Daphania caesalis, Ferrisisa virgata, Leucopholis irrorata, Melicodes spp., Melicodes tenebrosa, Nasutitermes luzonicus, Nipaecoccus filamentosus, Phytorus lineolatus, Planococcus lilacinus, Pulvinaria psidii and Thosea sinensis. Disease causing organisms include; Cercospora artocapi, Chanephora cucurbitarum, Fusarium spp., Nectria cinnabarina, Pellicularia salmonicolor, Phomopsis artocapina and Rhizophus nigricans. Several fungi are known to attack different parts of the tree. The white fly is a minor pest.